40+ Style » How to dress after 40 » How to Look Effortlessly Chic: 6 steps to help you achieve it! 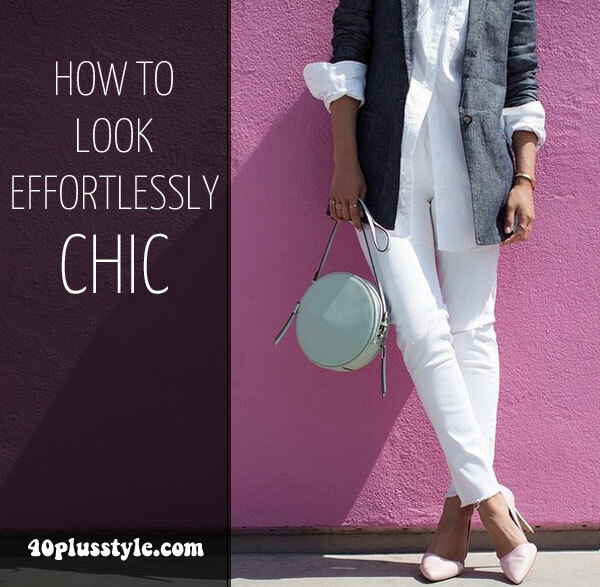 How to Look Effortlessly Chic: 6 steps to help you achieve it! We’ve all been guilty of not looking our best every time we walk out the door — life gets hectic! But the whole process of looking great shouldn’t be that complicated. I’m here with tips on how to get dressed easily and look effortlessly chic. Let’s start with your closet. Looking effortlessly chic requires organization. Clear out the clutter and get rid of anything that’s permanently stained, torn or doesn’t fit any longer. Anything that’s out of style or doesn’t fit should be donated for someone else to enjoy. Once the unused pieces are gone it’s time to edit out any items that aren’t attractive. Make it hard to put on an oversized, old shirt when going out by not having it hanging in your closet front and center. It’s just as easy to put on a pair of fabulous pants as it is to put on old sweatpants, so get rid of unfashionable, bad temptations! Once your closet is down to stylish clothes you like to wear, analyze if they’re versatile. To look effortlessly chic requires crafty mixing and matching of your wardrobe items. Keep only the pieces that fit the bill. Hopefully you now ended up with some open space in your closet! Be proud of your hard work and reward yourself with a little shopping. But before you go fill your closet up again, here’s some ideas to help you look effortlessly chic. Classics don’t have to be boring. Invest in timeless pieces like a good jacket, a pair of boots or some tailored blouses. Classics mix and match easily and can be dressed up or down. The next time you put pants and a shirt on, think about how you can layer the look. A good rule of thumb is to start with three layers: Your basic outfit + jewelry + a scarf, belt, statement shoe or handbag. As you get more confident, don’t stop at three layers. Add a cardigan, hat or belt (see also my article on how to wear a belt)– follow your inspiration. Although a business suit is an essential wardrobe staple, mix it up sometimes. The same goes with jewelry or the old-fashioned rule of matching your handbag with your shoes. To look effortless means you didn’t overthink your outfit. Break sets up creatively. A great way to do this is by using the rule of three again: use three different colors or tones in your outfit and accessories. Another way to make your look effortless is by not looking too stiff or contrived. Years ago, when I worked as a stylist on photo shoots, I would take the stiff, heavily starched clothing samples and wash them, giving them a very light steam instead of an iron. I liked showing things not too perfectly rolled up or tucked in. It made a big difference! Have your dry cleaner lighten up on starch and skip the stiff pleats some like to add to trousers and blouses. Not only do these look good, they also feel superb. One of the best ways to soften your style and look effortlessly chic is through your beauty choices. If you’re wearing an updo, leave a few tendrils to hang. Or avoid too much hair product or makeup, especially during the day. Have fun being effortlessly chic. No one needs to know it took some planning. What are your favorite effortlessly chic looks? 40+ Style contributor Cynthia Bowman is a former fashion stylist and current zen fashionista blogging about looking stylish while traveling with 2 kids, a dog and husband in tow. She currently lives in San Sebastian, Spain. She contributes articles on style and dressing to 40+Style. Great article. I am a fan of classic dressing with a modern twist. Love the shoes and bag you recommend. Glad to hear! It’s all about having fun and feeling good. I’d love to see an article like this that features pix of 40+ models, in a variety of sizes. Even those of us that have managed to stay trim and fit don’t look like an 18 yr old, size 2 model anymore. That’s our goal. Beautiful women come in all shapes, ages and sizes. If it’s any consolation, the model against the hot pink wall on the very first image is not a model — and she’s 48. Great and very helpful article Sylvia. It’s easy to forget that if you base your outfits around classics, but with an additional twist to stop the look being dated or boring, it gives you a great basic look, and you can’t really go wrong. It takes a bit more thought and experiment to move on to other looks, like how to wear tunics with skinnies or what length of skirt to wear and how to put a ‘skirt’ look together. That’s always a lot more of a challenge for me. You really keep us up to date and give amazingly helpful looks and ideas. Thanks for all of it. I so agree Aileen. Putting together skirt outfits is the pits for me. Never got the hang of it. For me, the key is putting together my outfits (including accessories) ahead of time more or less based on my schedule for the week. When I’m on my game, I make up 8 outfits every Sunday night (8 gives me a chance to not like something when it comes to actually putting it on.) If I wait until the morning, I don’t tend to get very interesting combinations, but fall back on the same old thing. Interesting idea Lisa, almost like a mini-capsule for the week. I am going to give it a try. I have most of the items but skirts is still someghing I cannot seem to master. Well. Pencil skirts, that’s OK but wider/ longer skirts… hell. 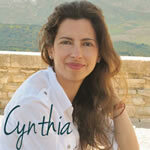 Hi Sylvia – Great article. I am turning 50. I don’t think I dress too bad but I want to dress more hip but do able for work. And also look great going out on a Saturday afternoon to the grocery store. I love boots and want to learn how to wear boots and leggings but still look good. Stuck in a rut in Port Bolster. Sylvia, I have recently started a blog that includes fashion and I need all the help I can get. I appreciate that your articles are concise and include lists. I love lists! I will be doing research at 40+Style on a regular basis! i love your articles but can’t see your recommendations. Is it me or because I am in iPad? Thanks! As this is an older article the recommendations are no longer available in stores and then they will disappear from the site.. Previous post: A week in British Columbia and Alberta, Canada – A road trip from Vancouver to Calgary in pictures!